Gov. Arnold Schwarzenegger, who outraged some Mexican-American groups last week by calling for a closed border, praised the civilian volunteer Minuteman Project for its patrols to spot illegal immigrants. "Look, they've cut down the crossing of illegal immigrants by a huge percentage," Schwarzenegger told KFI-AM's "The John & Ken Show" on Thursday. The Republican governor accused the federal government of failing to control the border and said it encouraged illicit crossers by giving them access to water. "The whole system is set up to really invite people to come in here illegally, and that has to stop," he said. The Minuteman Project involves hundreds of volunteers, some armed, who have been patrolling the Mexico-Arizona border since April 1 to document and report illegal crossings. Chris Simcox, a Minuteman organizer, welcomed Schwarzenegger's support. "It's gratifying to see that elected officials are responding to the will of the people," he said. There are plans to expand the patrols to California in June, a move Schwarzenegger "does not oppose," said Margita Thompson, his press secretary. President Bush has denounced the volunteers as vigilantes. Nativo V. Lopez, president of the Mexican-American Political Association, called Schwarzenegger's comments Thursday "nothing short of base racism." "Those of immigrant stock should have no illusions about what his real sentiments and feelings are toward them," he said. 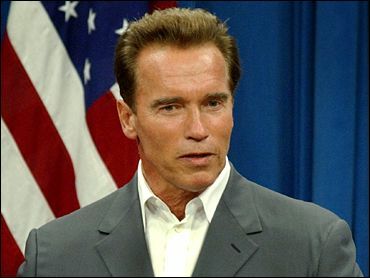 Schwarzenegger's press secretary called the issue a matter of national security. "It's not racist to ask the federal government to enforce its laws," Thompson said. Schwarzenegger's comments came a week after he faced criticism for telling a gathering of newspaper publishers that the United States needed to "close the borders." He apologized the next day, blaming faulty English and saying he really meant the borders should be secured. The Pew Hispanic Center estimates that about 11 million illegal immigrants live in the United States, half of whom come from Mexico. California is home to 2.4 million, far more than any other state.